We arrived and set up camp in the campground in the park "Bois de Boulogne" on the River Seine. Expensive but fairly convenient to town. They run a shuttle bus to the Metro station about three kilometers away (but it is not a free shuttle). 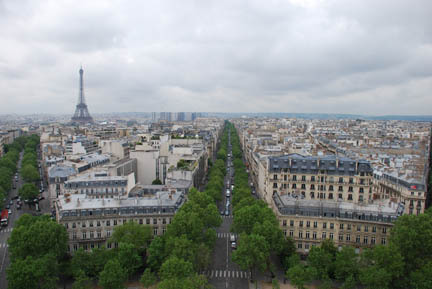 We went to the city the next day, headed for the Arc de Triumph and the Eiffel Tower. As we walked from the bus stop towards the Arc we encountered a Honda motorcycle dealer and set up an appointment for an oil change on Friday the 16th. (I have been planning on getting the oil changed here but I didn't figure it would be this easy to find the dealer.) In front of the Honda shop were several GoldWing motorcycle "taxis". If you look close you will see four of them, all silver, 1800 cc's. They have lap blankets for the passengers draped over the seats. (Lap blankets are very popular with the scooters and bikes in Paris, we saw lots of them.) 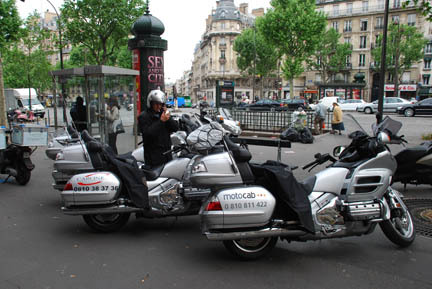 We also saw other brands of motorcycle taxis while we were walking around Paris but the GoldWings were the most interesting to us. I set up the appointment for the service and ordered the relay for the low beam headlights. 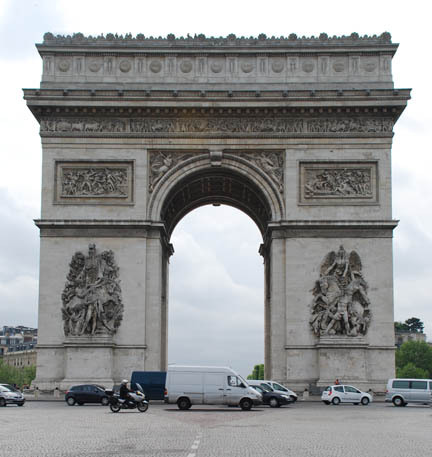 We then walked another two blocks and toured the Arc de Triumph. More will be added to this page after we are done with Paris. It sits in the center of this huge roundabout with heavy traffic going around it and 12 streets radiating out from it, the four of them at the cardinal directions are at least eight lanes wide. On the east and west sides of the roundabout there are pedestrian underpasses that come up in the center at the Arc so that you don't get killed trying to get to it. Under the arch is the Eternal Flame at the site of the grave of their Unknown Soldier. ...with a great view over the city. You'll notice its cloudy. We have stayed for a week in three different cities Pompeii, Rome and now Paris, and in each city we have had thunderstorms, with lightning and everything. Is it something about us camping for a week that draws them??? We then walked on to the Eiffel Tower. It is huge! And when it was built it was just a temporary structure for a world's fair. The invention of radio, and the need for antennas placed high in the air gave it a new job and saved it from destruction. The next day we went back at night and looked at them again. 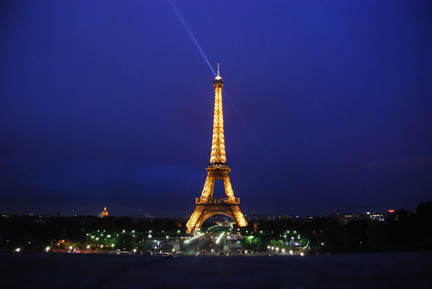 It has a rotating beacon at the top and every hour, for ten minutes, it has flashing strobe lights all over it. 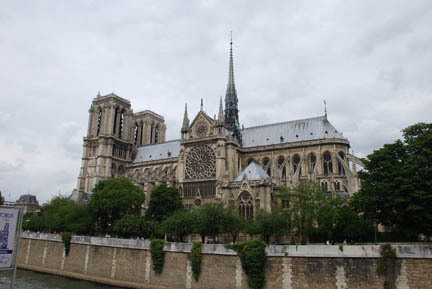 The next day I picked up the part from the Honda shop and we visited Notre Dame and the Latin Quarter. We walked around inside the cathedral and looked at all the stained glass. 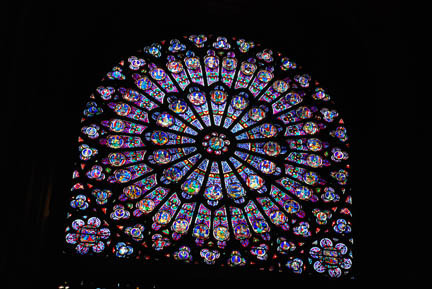 The rose windows are amazing. I wish we could have gotten closer. It must be nearly a hundred feet up to them. Then we wandered the streets and parks, having a beer at a sidewalk bistro and acting very French. On Sunday we replaced the relay for the low beam headlight that I had gotten from the Honda shop. This required removing the seat and the left saddlebag (pannier) just to get at the little box holding it. That solved the problem. We had been running with the high beam on since Morocco. Headlights are required and it was the only option, but I had adjusted it very high to avoid blinding oncoming drivers. 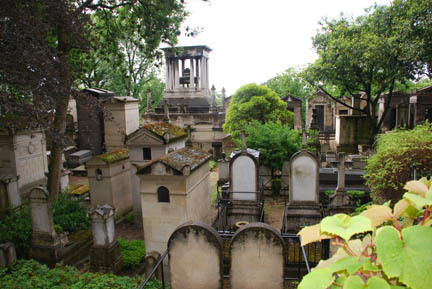 Later we went to the Pere-Lachaise Cemetery. This is where Jim Morrison, Oscar Wilde and Sara Bernhardt are all buried, as well as thousands of others of lesser fame. There are graves and crypts of various expense, some of them real monuments as in the center of the picture. The cemetery is huge with thousands of sites. There were many in a poor state of repair, but I saw no signs of vandalism as would have happened in an American cemetery. Many of the graves had small marble plaques or very pretty enameled metal wreaths laying loose on top of them. Many of the crypts were the size of one or two graves and were listed as "family so-and-so" with up to a dozen names on it. One can be seen in the picture lower left center, with the small window in it. 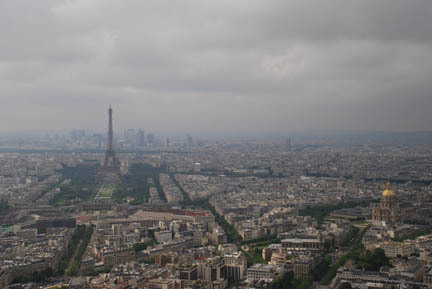 Then it was on to Montparnasse tower and a view over Paris. This tower is actually a modern glass skyscraper of 59 stories. But, as the brochure says, "the view includes the Eiffel tower". On Monday we went to the Louvre Museum. We got there early in the day and didn't have to wait in a long line to enter. The place is huge with four floors of art. Lots of paintings and sculpture, mostly from France all through the ages. The buildings started as a palace and then more palaces were built nearby and then they were connected and all told you walk miles to see everything, and climb and descend dozens and dozens of staircases. 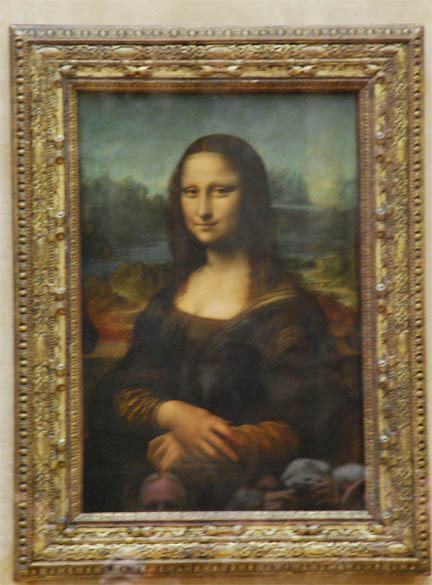 We headed for the Mona Lisa first. 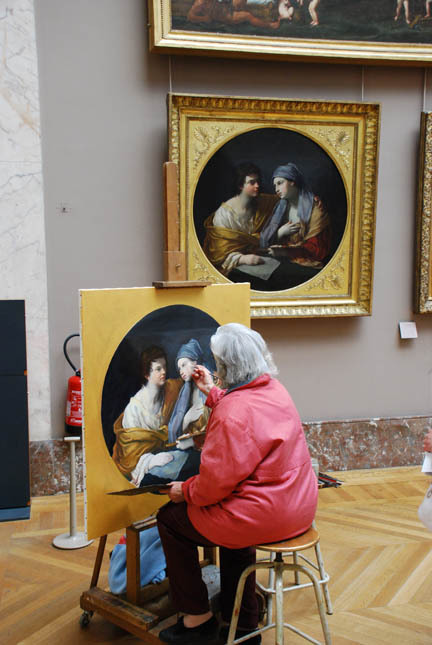 It is beautiful picture, but nothing really special among the hundreds of other great art hanging in the Louvre. 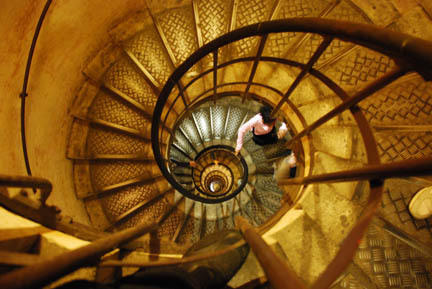 It has achieved a fame though that makes it a "must see". In several places there were artists who were copying a painting on the wall. These people were not one of the hundreds of art students who were practicing a new technique. There are real artists doing as well with their picture as the original artist did with theirs. This lady was superb. There was a lot of sculpture there, much of it like that we had seen in the Vatican, in Rome and in Pompeii. 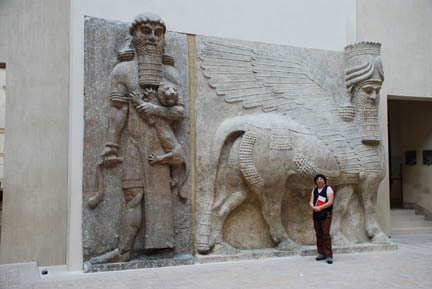 A different kind was this famous "Winged Bull" from Babylonia. 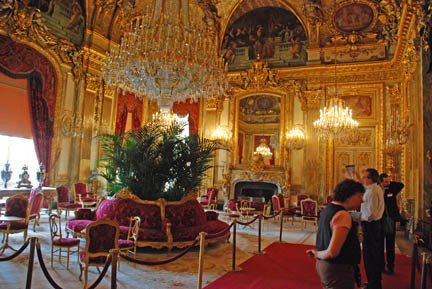 Lastly I'll show you the Napoleon Apartments in the Louvre. This is how and where he lived. Nice place! Reminds me of the Mittlebach's palace in Munich, Germany. On Tuesday we headed for Versailles, the famous palace where the kings lived.